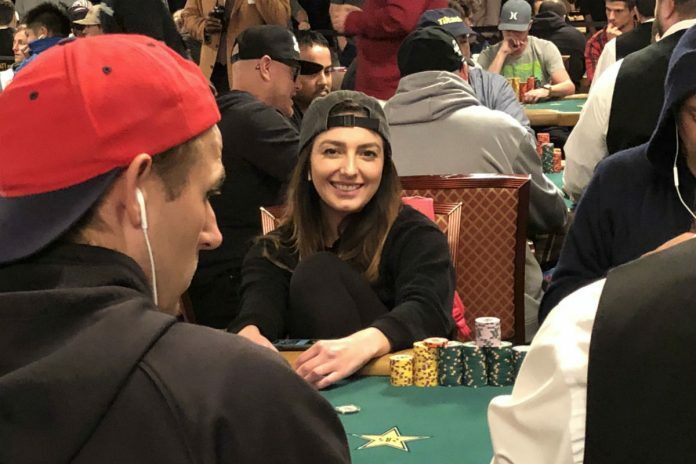 Kelly Minkin finished Day 4 of the 2018 World Series of Poker Main Event with a top 10 stack thanks to a hero call late in the day. In what felt like a flash, the 2018 World Series of Poker Main Event suddenly just has 310 players left with Barry Hutter standing on top of the entire field. Sunday’s play started with 1,182 players all still hoping to become World Champ, but over 5.5 two-hour levels of play, 872 players were shown the door. Hutter managed to do some damage on Day 4 and ended up bagging nearly six million and the chip lead. Four former #1-ranked PocketFivers managed to advance to Day 5 with Shaun Deeb ending with the highest chip count at 2,175,000. Cliff Josephy (1,985,000), Paul Volpe (1,070,000) and Chris Moorman (907,000) are also still alive. A key moment for Kelly Minkin came late in Level 19. Faced with a decision for roughly 60% of her stack, Minkin eventually managed to call her opponent’s all in river bet and tabled a paired king for second pair – good enough to beat Ivan Galinec‘s flopped third pair. Minkin finished Day 4 with 3,459,000, good enough for the sixth-largest stack. All eyes, including those of the viewers watching at home on ESPN, were on Phil Ivey on Sunday. The 10-time bracelet winner started the day with a decent size stack and was at one of the ESPN secondary feature tables. Ultimately, Ivey was unable to navigate his way through Sunday’s landmines. Ivey raised to 22,000 from middle position before Brian Altman made it 75,000 to go from late position. After the blinds folded, Ivey called. The flop came [qc][js][2s] and Ivey checked. Altman bet 60,000 and Ivey called. The [8s] turn got both players to check. The river was the [3d] and Ivey checked to Altman who bet 195,000. Ivey moved all in for 629,000 total and Altman tank-called and showed [qs][jc] for top two pair while Ivey flashed pocket nines before exiting the Amazon Room. Scattered throughout the bustouts on Sunday were a number of prominent players including former World Champions, the start-of-day chip leader, European Poker Tour champion and a number of other familiar faces. Action resumes at 11 am PT with players expected to play another 5.5 levels.